R.J. Rushdoony: 01:42 The third and the ninth commandments are very closely related. Both are concerned with speech. The third speech, thou shalt not take the name of the Lord thy God in vain, for the Lord will not hold him guiltless that taketh his name in vain. The ninth, thou shalt not bear false witness against thy neighbor. Both are concerned with speech, but one has reference to God, the other to man. R.J. Rushdoony: 03:31 Many ministers, and I heard this from a number of them, who otherwise felt the book was a very fine was, refused to recommend it to their members because of this statement. They want the third commandment to have primary have reference to the use of bad language. But as Ingram pointed out, an entire conformity with everything that the Bible and church history has taught us, its primary reference is to the legal oath. The oath of office. The oath of witnesses. This is that which the commandment refers to. R.J. Rushdoony: 04:25 The stability of any society depends upon a common regard for truth. This stability of any church depends upon the faithfulness of the clergy to their ordination vow or oath. The stability of marriage, which is the foundation, socially of any society, depends upon the faithfulness of man and wife with the marital vows or oaths. R.J. Rushdoony: 05:09 You can immediately understand to how far we have gotten. With respect to marriage, it used to be the standard practice that in case of divorce the guilty party suffered legal penalties, punishment. They had committed an offense against society. This is long since disappeared. So that the law today in effect says in the event of a divorce that both parties are innocent or both parties are guilty, it makes no difference. R.J. Rushdoony: 05:49 It was once mandatory that when a pastor had any change of ideal with respect to scripture after his ordination vow, he was duty bound to report it to the conference, to the senate, to the presbytery, to the bishop or whatever the jurisdiction in his church. This is long since disappeared. And today they casually violate their ordination vows, almost from the beginning. I shall never forget when I had just entered seminary, listening as a senior classman returned from his examination before a Methodist committee. He was asked how he had done, and he said, “I came through with flying colors, both according to their scoring and mine. I affirmed all the articles of religion without believing a one of them.” This young man, a Methodist, has since gone very far and is now a prominent scholar in one of the most important universities in the United States. R.J. Rushdoony: 07:23 Today in our courts of law, witness oath means nothing. The most flagrant kinds of lies are routine. The oath of office to uphold the Constitution, again, means nothing. But the oath is important. It is basic to society. In the oath, man promises to live by his word, by the oath he has taken, as God keeps his word. Absolutely. In taking an oath, a man invokes all the judgments of God for violation of that oath. And although men today may have no regard for the oath, God declares he will not hold him guiltless by taking his name in vain. 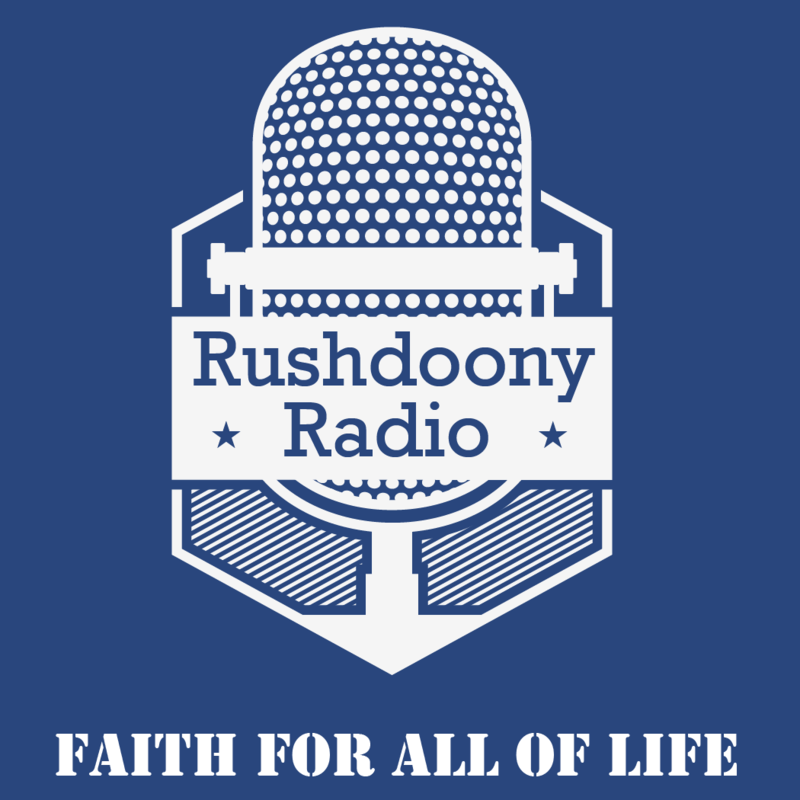 R.J. Rushdoony: 08:29 Sometimes we hear people say there’s no reference to biblical faith in the Constitution. This is of course a mark of ignorance. The oath of office. And when they required an oath of office, they knew exactly what it meant. It was the legal recognition of biblical faith and of the God of scripture and of the savior of scripture. In taking that oath, they invoked all the penalties of the law upon themselves for violation of the oath. R.J. Rushdoony: 11:01 When Washington wrote the farewell address which he gave a great deal of pains and attention, and in the writing of which he consulted at great length with some of his cabinet members. He had his eyes on the French Revolution. The French Revolution had overthrown Christianity and had substituted reason as God. Washington was fearful that this kind of atheist and anarchism would spread to the United States. What future would there be for any country when biblical faith disappeared? What would happen to the courts if the oath had no significance? If a man solemnly swore by his reason in terms of his thinking, in terms of what he called proof that felt the truth? R.J. Rushdoony: 12:27 Washington was rightly concerned because to despise, abuse or profane the oath is an offense which denies validity to all law and order, to all courts and to all offices. It is an act of anarchy and revolution. We’re going at it backwards, are we not? We’re treating the symptoms. We’re upset because there is anarchy in the streets, revolutionary anarchy. We are distressed because the Supreme Court is despising the Constitution. We are only interested in the symptoms. But you can never heal a man by treating symptoms instead of the disease. Washington put his finger on the disease. Destroy religion and you destroy the oath which is the cornerstone of any kind of security, for light, for liberty, for property and, he said, for reputation. R.J. Rushdoony: 13:50 Now in terms of this, let us turn to our scripture. Leviticus 24, versus 10-16. This is a difficult one for the modern mind to understand. Because of course we have lost the sense of blasphemy, of cursing, of fall cursing, having relationship to the oath, to the legal oath. Now let us read a portion of this from the ancient [inaudible 00:14:28] version, which is to an extent paraphrased, which will tell us from pre-Christian times how to Hebrews understood this. R.J. Rushdoony: 14:41 While the Israelites were dwelling in the wilderness, he, this half-Danite, half-Egyptian man, sought to pitch his tent in the midst of the tribe of the children of Dan. But they would not let him, because according to the order of Israel, every man according to his order dwelt with his family by the ensign of his father’s house. They strode together in the camp, whereupon the son of the Israelitish woman and the man of Israel who is of the tribe of Dan went into the house of judgment. Now do you see the context? R.J. Rushdoony: 15:24 There was a set place for everyone to pitch their tent as they moved through the wilderness according to the ensign of their father. If your father was a Danite, then you pitched tent in the area assigned to Dan. But this man’s father was Egyptian, and so there was a separate place for those who were of an Egyptian background to pitch their tents. His grandfather was Danite and he sought to pitch his tent among the Danites, and he was told this is not your place. They quarreled. Therefore they went into the house of judgment in the court. A judgment was given by the court. R.J. Rushdoony: 17:19 He was immediately arrested, tried and sentenced to death. What he had affirmed was total revolution, absolute cessation from any society which denied him his wishes. No society can long exist that permits such subversion. Can you allow people to deny the oath, to walk out of a court and declare they have no intention abiding by the law? Who declare that they are going to overturn any society that denies them their wishes. You have revolution. And you either execute the person or you are executed. R.J. Rushdoony: 18:27 This is why we as a society are headed for execution, because we extend total tolerance to these people when they deny the principal of law and order. Did we not see this in Chicago? Over and over again, day after day, they met, and there were persons, informers attending the meetings. Some of the documents were secured. What did they say? We will work to provoke the police, to destroy law and order. If we are arrested we will lie, we will say that the police clubbed us without any offense. We were marching peaceably. In other words, they said “we will deny the principal of law and order.” They were guilty of blasphemy. They should die. They have affirmed total revolution, total cessation, total anarchy. What have we done? We have treated those who have tried to enforce the law against them as though they were the criminals, as though they are the persons to be investigated. R.J. Rushdoony: 20:05 Now let us examine another aspect of this passage. The fifteenth verse, God declares through Moses, “whosever curseth his God shall bear his sin.” This is an interesting passage. I’d never heard anyone discuss it. But it is central to what scripture teaches. Any and all gentiles, in other words, who despised or violated the oath of their religion, of their god or gods, were subject to the laws of their religion to whatever penalties their law imposed for such an offense. At this point and this point only, the bible affirmed the validity of any other nation’s law, so that if an Egyptian violated his oath in terms of religious principals in the Egyptian religion, whatever the penalty was according to the Egyptian law, he suffered that penalty. Or the penalty of the Babylonian law, or the Syrian, or Assyrian, or Philistine law. R.J. Rushdoony: 21:46 At this point, and at this point alone, the oath, the bible recognized to a measure the validity of other national laws and other religions. Now the modern mind sees good in all religions because it doesn’t see any truth in any of them. It says they’re all equally good, which means they’re equally bad, because they contradict each other. The bible declares that there is only one true religion and all the others are false, for all the gods of the nations are idols. But the Lord made the heavens. The bible therefore recognizes only biblical faith as the one true faith. It doesn’t not give any other religion an iota of ground. That’s true. R.J. Rushdoony: 22:55 But in terms of law and order, in terms of society, it declares that the oath of these religions fines a man in his country so that if they violate their oath they suffer the penalties of the country of their citizenship. In other words, the bible is tolerant to a degree of other social orders, although it recognizes that the only true law order is bounded on biblical faith. But it knows that the key to remedying the situation is not revolution. The key is regeneration and the gospel. In the meantime the existing law order must be respected as far as possible without offense to that faith. R.J. Rushdoony: 24:11 So it is that biblical faith at this one point recognizes other laws, which again emphasizes the extreme importance, the centrality of the oath. Moreover, in Leviticus 5, verses 1-7, the law declares that if anyone witnesses a false oath, if they are in court and they hear someone under oath make a statement that is false and they do nothing about it, they are guilty before God and must offer a trespass offering. R.J. Rushdoony: 25:03 Proverbs 29:24 says the partner of a thief hated himself. He heard the curse that is pronounced on a thief in taking the oath, but says nothing. That is, he himself gives false testimony. In a sentence, the position of scripture with regard to the third commandment is this, that a false oath is an assault upon the life of an entire society, and an offense against God. Therefore the Godly must hate false swearing, and they must oppose it with all their might. R.J. Rushdoony: 25:52 Heresy, also, we must add is false oath taking. When a member joins a church, he goes forward and declares before God and the members of the church that he accepts the faith of that church and to depart from that faith or attempt to subvert it is to take a false oath. The same is true of the clergy. We cannot say in these circumstances that I have only been disloyal to a church or I have only been disloyal to the doctrines of a church, true enough. But the oath is taken, the ordination vow, or the affirmation of membership before God. So it is first of all an offense before God. God requires that if a person depart from the faith of that church, they leave it for another. Not to violate their oath because they have taken an oath under God to be faithful, and their first loyalty therefore is to God to abide by that oath. R.J. Rushdoony: 27:29 Someone recently reported to me a case where a man entered a church, took ordination vows, then promptly refused, because he was [inaudible 00:27:46] to read the ten commandments, which was part of the Holy Communion during the service. He believed himself to be a good God fearing, bible believing man. He was guilty of blasphemy. God regards him as a blasphemer because while he claims to believe the bible from cover to cover, he has deliberately violated the third commandment. He cannot say that I believe in terms of my interpretation of scripture, and I believe the cover from cover to cover, that this particular church is wrong in using the law, because we are no longer under the law. This is his position. R.J. Rushdoony: 28:44 But it is more than a loyalty to that church. It is a loyalty to God. If he so believes, he is under obligation to depart from that church. Then he is true to the law. He doesn’t stay within the church when he finds that he can no longer abide by what the church is. A false oath is an assault on the life of entire society and an offense against God. Today in more and more of the United States, perhaps virtually all of the United States by now, when you go to court or you take an oath of office, it is without any reference to the name of God. This is true in California. You simply say, “I solemnly swear to tell the truth, the whole truth, and nothing but the truth.” No reference to God. R.J. Rushdoony: 29:54 Now what does this mean? A man swears then by himself. What is the reigning philosophy of the schools and of the courts, progressivism or Deweyism or the teachings of homes and the courts which is Deweyism, in other words, pragmatism. Truth is what works. When you testify, you tell that which works for you. Is it any wonder that our courts are in the bind that they are? That they are breaking down? That the liar has an advantage? That there is no prosecution any longer or perjury? After all, how can a man perjure himself in terms of a pragmatic philosophy? R.J. Rushdoony: 30:56 The oath, when it is removed from the court removes thought from society and it removes truth. Because the oath in God’s name establishes God legally as the ground of society and God’s definition of truth as the definition of that society. The removal of God from the oath, from the light and dishonesty [inaudible 00:31:36] is a declaration of independence from God and a declaration of warfare against God. A declaration of water in the names of the new gods. Apostate man. This totalitarian state. Thus, we see why scripture so profoundly emphasizes the importance of the oath [inaudible 00:32:12]. R.J. Rushdoony: 32:17 Our Lord and our God, we give thanks unto thee for thy work. We thank thee that thou has declared that thou wilt not hold him guiltless that taketh thy name in vain. So our Father, we await thy judgment upon this generation. We thank thee our Father that thy judgment is sure and it shall not fail. Give us grace therefore to rejoice when judgment falls, and to know that thy judgment is our deliverance. R.J. Rushdoony: 33:01 Therefore, our Father, increase our faith, make us strong in thy law word. Make us [inaudible 00:33:13] in the proclamation of thy saving grace. Make us valiant in the defense of those things which are true. Make us confident with the knowledge that if God be for us, who could be against us. Our God, we thank thee. In Jesus’ name. Amen.